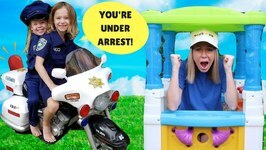 The Crazy Car Store worker is selling Maya broken Power Wheel cars and she is tired of getting ripped off! Each ride on kids cars keeps breaking down and she has to keep ..
Crazy BROKEN Car Store !!! Silly Worker with Addy and Maya !!! 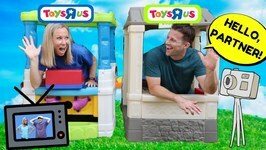 The competing fake workers are back with their Toys R Us stores and they have finally decided to work together! That's right, now Lucy and Jason are teaming up with each .. 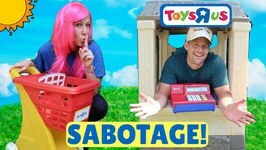 Fake TOYS R US Stores Work Together Then Compete and PRANK !!! The fake Toys R Us worker is really trying hard to ruin her competition. Today, she's buying up all of his inventory and pranking him by returning everything broken or ..
Addy and Maya have had enough! After being sold some MORE broken toys from the pretend Toy Store, the girls are going to go after the worker and give her a talking to. Addy and Maya are going back to school after a long end of the summer. But this isn't your normal classroom, this is the Toy School. Today, Toy School is welcoming an old friend of ours the pretend Toy Store worker! It's Candy Day at Toy School and Addy and Maya are eager to "learn" today's lesson. 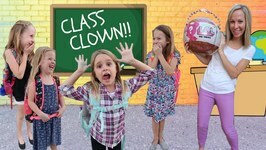 It's another day at Toy School and Miss Lucy, our favorite teacher, has bonked her head and may have lost her marbles! She can't seem to get her ABC's right and she is .. It's test day at Toy School and Addy is feeling sick so she decides to skip school. While Maya is busy with her silly class work, Addy plays all day long with her new ..
Miss Lucy is out today and the kids at Toy School have a new silly teacher. Welcome Mr. Jason to the classroom girls! 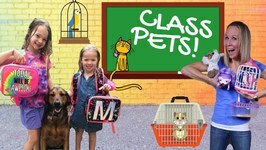 Addy and Maya don't know what to do with all of the ..
Toy School is getting a new class pet! Or maybe the pretend teacher is just going crazy! Either way, Addy and Maya are back in the silly classroom with Miss Lucy and we .. The silly teacher Mr. Jason is back and he is still not happy about the pretend Toy School. There is just no real learning being done in this pretend classroom by Miss Lucy. Addy and Maya are tired of all the same old toys at pretend Toy School. Miss Lucy doesn't know that there is a magic wand in the classroom that the girls can use to ..
Maya's Magic Wand at Toy School !!! The fake Toy School gets another new student today! Welcome to the class Sophia! Addy, Maya and Avery are going to have to keep it together when the new kid starts off as ..
Something is happening at Toy School and Addy and Maya are spooked! All of a sudden Miss Lucy's pretend class has changed. There are skeletons, spiders, rats and skulls. Addy and Maya are getting a lesson on how to create better kids YouTube videos. Miss Lucy is not happy about all of the mess ups and bloopers that the girls are doing. Addy is having a hard time smiling for the camera during class picture day at the fake toy school. 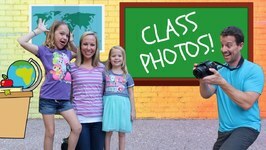 Maya and Miss Lucy have already taken their photos but Addy keeps on ..
Class Picture Day at FAKE Toy School !!! The girls are earning some extra credit at fake toy school today! 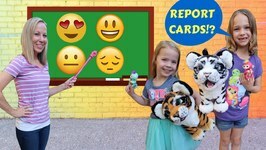 Addy and Maya are so excited to be able to play with some brand new toys at their pretend classroom and ..
Addy and Maya Earn Extra Credit at Fake Toy School !!! There's a silly student at our pretend Toy School today. His name is Mr. Jason! The only way he can leave the pretend class is to win a classroom challenge. New Silly Student at Toy School !!! There's a new good teacher coming to our fake toy school today! Miss PaDoodle brought a ton of fun new toys with her to the pretend classroom. New GOOD Teacher at Fake Toy School !!! The new teacher, Miss PaDoodle, is in training at fake Toy School today! She has to help Miss Lucy gather up new candy for her pretend classroom by going around ..
Avery and Sophia are back to join Addy and Maya as the silly classroom gets out of hand! Miss Lucy can not contain these kids at pretend Toy School. Toy School Kids Play With Pretend Teacher !!! It's Miss PaDoodle's first day as the new teacher at pretend Toy School and Addy and Maya aren't so sure about it. 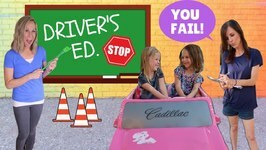 Miss PaDoodle is back to teach Driver's Ed to Maya and Addy at pretend Toy School. Hopefully everything goes well. Addy and Maya Take Drivers Ed at Toy School !! !